Watch as the soft glow of the Amish Deluxe Small Wall Curio Cabinet draws family members and friends over to take a peek. Your treasured keepsakes and collections are a joy to collect, let them shine on the shelves of an Amish made curio cabinet. From antiques to family heirlooms, these precious items have a story to tell. Bring them down from the attic and onto the glistening shelves of a glass curio cabinet. 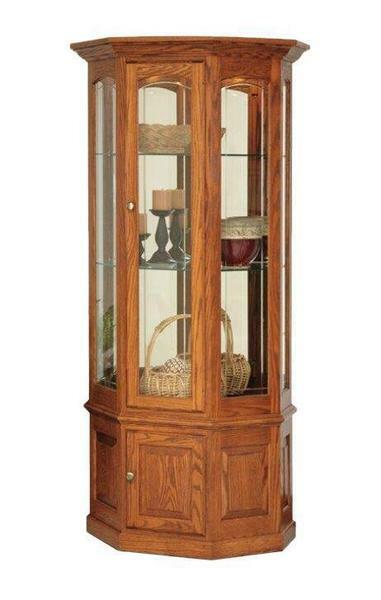 Our collection of Amish Curio Display Case Cabinets offers a variety of styles. This Deluxe Small Wall Curio Cabinet is shown in oak wood which is a strong, heavy and light colored hardwood. Oak creates a warm welcome wherever it's displayed. Customization options offer you touch lighting to illuminate you display as well as additional shelves for larger collections. Enjoy our popular blog post, Curio Cabinet of Curiosities that offers curio cabinet features and styles. Call us today, toll-free at 866-272-6773 with any questions.